AltaMed Health Services hosted LatinoFoodie and other local food bloggers to preview its upcoming 6th Annual East LA Meets Napa celebration at Union Station on Friday, July 8. Now, we’re not talking rice and beans here. This was everything from black mole tamales to duck confit tacos topped with a jamaica and tomatillo sauce. 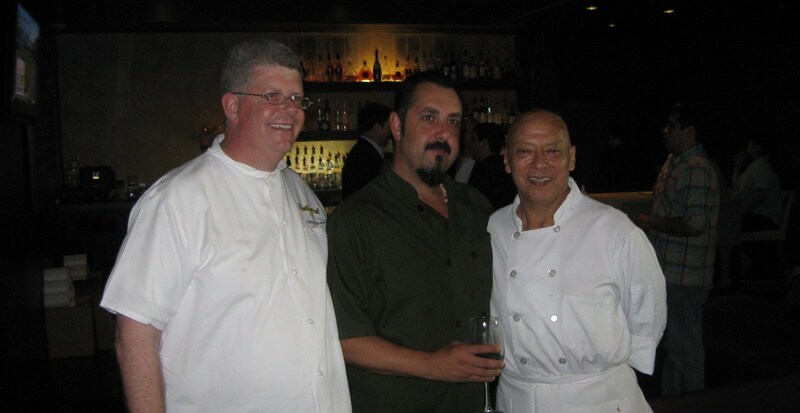 Pictured Left to Right: Lotería Grill Chef & Owner Jimmy Shaw, Guisados Chef & Owner Ricardo Diaz, and Seta Chef Hugo Molina. Not pictured are the chefs from Phlight in Whittier, CA. 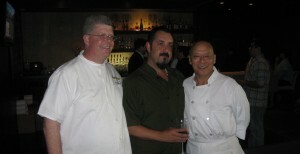 Setá Restaurant in Uptown Whittier with renowned Chef Hugo Molina served as host to about 20 people. AltaMed CEO Castulo de la Rocha opened saying this year’s fundraiser is all about the regional cuisine of Michoacán, where many of the featured wine makers are originally from (as well as De la Rocha). We hear the event will showcase live Latin jazz and mariachi music, lots of mingling and more than 60 wine and food pairing stations featuring some of the best wine and food from Latino owned or operated Napa Valley wineries. East LA Meets Napa raises money to support AltaMed’s mission of increasing access to quality and culturally relevant health and human services to under-served communities in Southern California. We had the pleasure of sitting next to Esmeralda Fabian, a lifestyle reporter from La Opinión (the country’s largest Spanish-language daily newspaper), and Holly Wong, editor of The Endless Supper, a food blog in Orange County. Thankfully, they were great table companions who made diving into the scrumptious Mexican dishes paired with California wines even more enjoyable. Chef Hugo Molina & Chef Aricia Alvarado of Setá started the afternoon with a Chilled Avocado Soup with Tomato Congee paired with a 2007 Solovino Chardonnay. 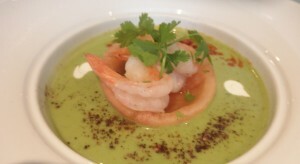 The soup was a velvety puree of avocado, infused with cilantro, and topped with a perfectly cooked shrimp. This would be a perfect introduction for those cold soup hold-outs. Nothing says “California Summer” more than ripe avocados and a crisp Napa Chardonnay. Setá also served the most amazing slider. Yes, slider. The Puerco Barbacoa with Chiluaque Sauce, Chipotle Mayonnaise and a Cabbage Salad had pork so tender and flavorful since it was cooked in banana leaves. The cabbage salad was no slouch either. The clean fresh pickled citrus slaw was a perfect accompaniment to this plated pork perfection. 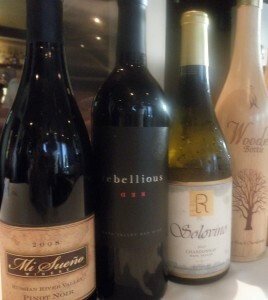 Paired with the slider was (drum roll please) Rebellious Red, a premiere 2008 red wine from Sequoia Grove Vineyards. This humbly dressed red wine certainly “shook things up” at our end of the table, as promised by Mike Trujillo, Director of Winemaking. We couldn’t get enough of it. 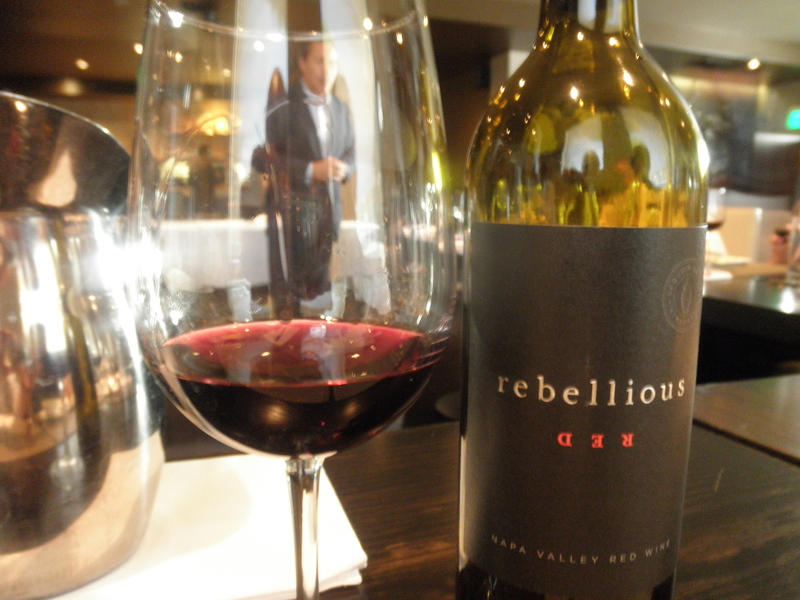 We were wondering if it was okay to get a little tipsy at these events, but with a wine called Red Rebellious being served it was like a green light turned on for us at a traffic stop. Next up was Chef Jimmy Shaw of Loteria Grill. We temporarily (and a bit reluctantly) relinquished the Rebellious Red for the oaky Solovino Chardonnay, from Rios Wine Company, to taste Chef Shaw’s Chile Verde de Callo de Acha. The ocean fresh sea scallop swam in a porcelain soup spoon, floating pretty in the cilantro/lime sauce, hiding the fire within. Clearly, one spoonful was not enough. Third up was Chef/Owner Ricardo Diaz hailing from Cook’s Tortas and Guisados. 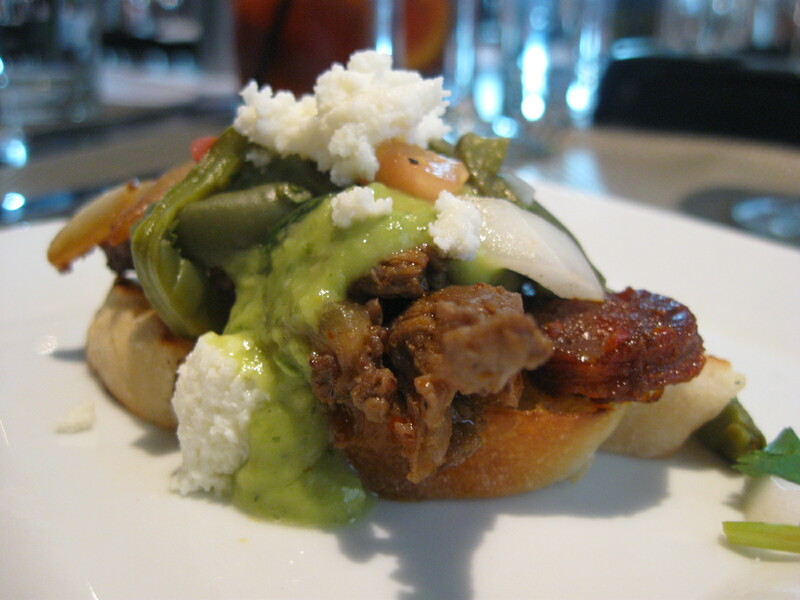 From Cook’s Tortas he brought us Torta Mi Ranchito, an open-faced dream of dry aged chorizo, carne asada, nopales, cotija cheese, and a spicy avocado-serrano chili. 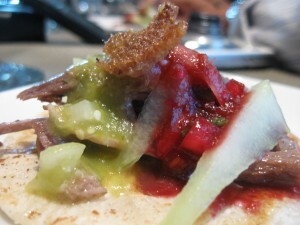 The piece de resistance was Guisado’s carnita-style Duck Confit taco, with a small duck skin chicharon on top. 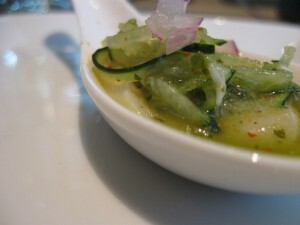 The little bite had two sauces: a tangy jamaica sauce and a spicy tomatillo sauce. The duck taco paired with a Russian River Valley 2008 Pinot Noir from Mi Sueño Winery. At this point our belts were all a little tighter and our buzz a little heavier, but dear readers, we marched on. 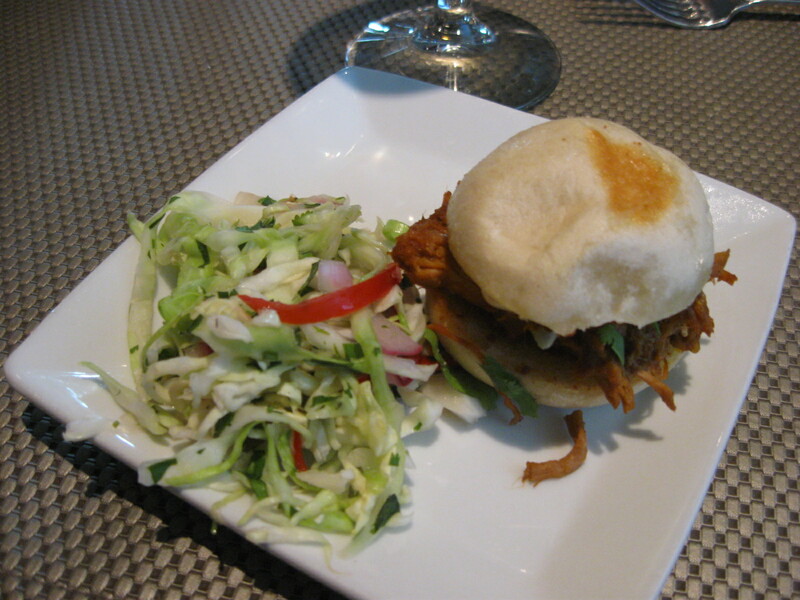 Phlight Restaurant & Wine Bar in Uptown Whittier rounded out our preview selection. 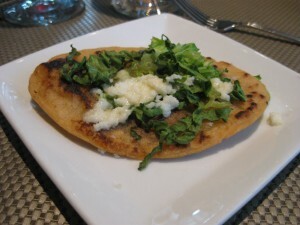 We were treated to a Black Bean Stuffed Huarache with a Tomatillo Puree and a little fresh cheese. This went surprisingly well with the Solovino Chardonnay. We joked at the table that the huarache was so good we could eat a whole plateful, especially after a night of drinking. Esmeralda from La Opinión said she can eat them like cookies. Some of us licked up the last remaining crumbs or tapped out wine glasses to get the last of our wine. In the end, we were all wishing we had worn pants with an elastic waist. As a special treat, we got to sample two more wines. Marco P. Oliver, founder of Wooden Bottle has definitely brought something new to the table. With his clever & stylish wooden bottles he wooed us into 2 more glasses of his wine. The California chardonnay was fruity with a hint of warm spice and a nice long finish. Wooden Bottle’s Peach Chardonnay, a dessert wine ideal for any impromptu rooftop summer parties.